Chilly Rainstorm, Chilly for short, was Rainy's last foal. He was born on a farm in Maryland on a chilly April morning, hence his name. He was sired by Stormcloud, a son of Beebe Breeze, who was the Chincoteague Miniature Pony Farm stallion at the time. He resembled his sire very much with his chestnut colored coat and wide blaze. Chilly was not meant to be a breeding stallion so he was gelded when he was old enough. Mike Pryor bought him later on, and Chilly went to live with a large herd of his relatives in Pennsylvania. There he was known as Sea Star or Stormy Chili Rain. 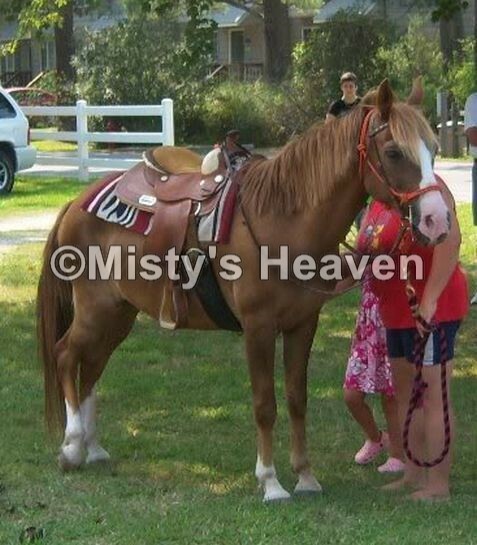 He has made one appearance on Chincoteague which was during Pony Penning 2008 and he was used as a pony rides pony.